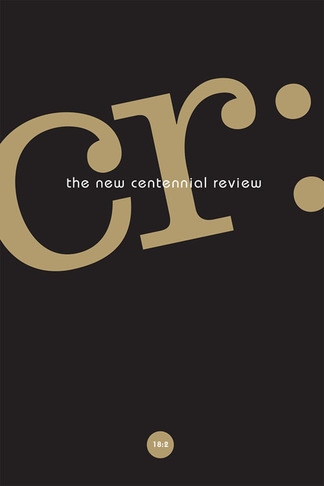 Over the last few years I have been working with Irving Goh on a special issue of CR: The New Centennial Review and it is finally online. It brings together statements by composers Joanna Bailie, Tatiana Catanzaro, Carolyn Chen, Ashley Fure, and Fabien Lévy alongside essays on music by Claire Colebrook, Jeffrey Di Leo, Jeremy Braddock and Timothy Morton, Jean-Luc Nancy, Naomi Waltham-Smith, and Holly Watkins. It also includes my own text, ‘Who Vibrates?,’ which tries to think about Carolyn Chen’s music and how New Materialist theories of vibration, vibrancy, and animation intersect with colonial histories of race and subjecthood. I am very grateful to all our contributors who took the time to make this collection possible and to Irving for including me in the project. Huge thanks to Martin Fahlenbock, Shizuyo Oka, Barbara Maurer, Åsa Åkerberg, Melise Mellinger, Jaime González, Klaus Steffes-Holländer, and Christian Dierstein of ensemble recherche, to Clara Iannotta and John Pax who performed as guests, to Anthony DiBartolo & James Bean for respectively recording and amplifying the performance, to James and Seth Torres for their help with this tricky mixing job, and to everyone else at Harvard who helped bring this into the world. To complement the ‘Gender Relations in Darmstadt’ panel put together by Ashley Fure at this year’s International Summer Course for New Music Darmstadt, I put together a visual overview of gender balances at concerts at this year’s festival. Even more interestingly, Fure collected the data from Darmstadt’s archives on gender representation across the years, and the official GRID Blog includes various other articles and resources. Huge thanks to John, Ari, Chris & Kevin for their amazing dedication to making this sound so good, and also to Anthony DiBartolo & James Bean for their recording and amplification chops.